Point of View (POV) is the position you take as a writer while you narrate your content. It’s your lens, like a camera. Write from a POV by paying attention to the pronouns you use. Write about experiences in your own voice using I/me, we/us, my/mine, our/ours. Write by addressing the reader in a conversation, using you/your/yours or you understood. Write about experiences as an observer who is outside looking in, using he/she/it, his/hers/its, they/them/their. When to Use Which POV? First person is used in both fiction and nonfiction. Second person is frequent in nonfiction – especially copywriting – but rare in fiction. Third person is the most common POV in fiction. Copywriting and content writing are a conversation, not a lecture. That’s why a combination of all 3 POVs, with a special emphasis on first and second person POVs, work best. Here's an example using just third person. Writing with proper POV is a common problem (third person). Writers use third person and don’t know why they struggle to make their copywriting conversational (third person). A large percentage of new writers face this challenge (third person). 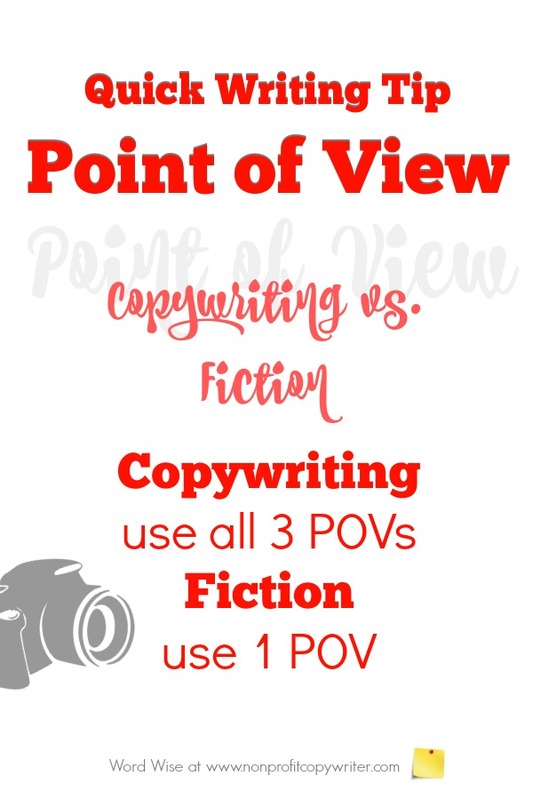 When I first started copywriting, I had to learn POV basics (first person). Writers use third person and don’t understand how to make copywriting conversational (third person). Is it a problem for you, too? (second person). In copywriting and content writing, it’s natural to switch back and forth between point of view, particularly first and second person. Not so with fiction. When you write fiction, pick one POV and stick to it – most often first person or third person. This one-POV-rule applies to writing stories in your content. I wish I could say this doesn’t happen often (First person). Writers switch between POV and don’t know they’re doing so (Third person). Is it a problem for you? (Second person). “I wish I could say this doesn’t happen often,” said Jane, the writing coach. She went on to explain that new writers often switch POV and don’t know they’re doing so (third person). “It was a problem for me when I started writing and it may be a problem for you, too – so let’s get started at fixing it,” she said (third person).